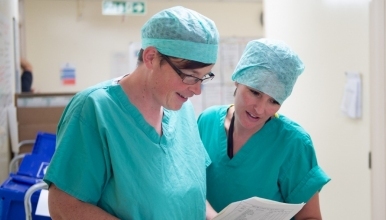 The Endoscopy Unit at The Royal Shrewsbury Hospital is currently looking to recruit permanent Band 5 Staff Nurses or Operating Department Practitioners with full or part time positions available. Patient care, experience and staff well being are at the forefront of our philosophy. This has been recently demonstrated with us gaining our JAG accreditation and a Values in Practice award for Safety. We currently provide an Endoscopy service for both Outpatients and In patients undergoing gastroscopy, sigmoidoscopy, colonoscopy, cystoscopy, bronchoscopy EBUS, peg insertion, oesophageal stenting, ERCP and EUS. The Endoscopy Unit is currently open between 8.00 am and 10.00 pm, including Bank holidays. We also provide a comprehensive “on call” rota, covering evenings, weekends and bank holidays which the successful candidates will be expected to take part in after specific training. Visits to the department are welcome. Our aim is to provide the very highest standard of care to our patients, ensuring privacy and dignity is maintained at all times. The successful candidates will be responsible for patient care pre, during and post procedure, assisting the Doctors and Nurse Endoscopists, working in the procedure rooms, recovery and the decontamination area. The candidates should have a professional nursing qualification or Operating Department Practitioner equivalent. Experience in Endoscopy or Operating Theatres is preferred but not essential. Candidates need to be highly motivated, enthusiastic, and possess excellent communication skills combined with the ability to work under pressure. In return we will support your continued personal and professional development, whilst working in a busy, friendly department. It’s very important that we select the right nurses to come and work for us. The selection process for all nursing posts will include a Conversions, Medicines Management and Nursing Practice Numeracy Test. You will be invited to sit these assessments if you are successful for the position.